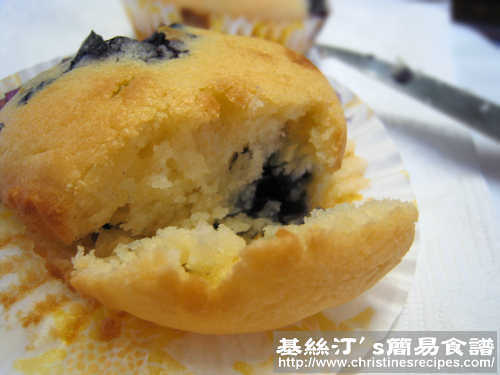 Muffins are popular and delicious snack. When baked with blueberries, they even taste better. I love eating light and fluffy muffins because they won’t make me feel stuffed. Mini muffins are my first choice. I don’t need to find someone to share with me if the muffin is too big or too heavy. But if I’m still hungry, I can eat one more. The best muffins are the moist ones. Here’s a trick to ensure to bake incredible, moist and yummy muffins. Preheat oven to 200C. Lightly beat the egg. Set Aside. Use microwave oven or put butter in a bowl over hot water until melted. Let it cool down. Pour melted butter into the beaten egg. Add milk (see picture 1) and mix well. Use another bowl to mix salt, sugar, baking powder and sifted flour (see picture 2). Gradually pour the egg mixture into the middle of flour mixture. Use a spatula to mix well until just blended. Don’t over stir it. 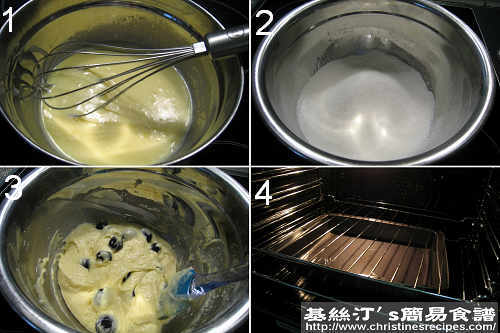 Add blue berries (see picture 3) and fold through. Transfer the mixture to a nonstick muffin tray or muffin cups that line with paper, up to 70-80% full. Put a rack in the middle of oven to bake muffins. Add one more rack to hold a baking pan and fill it halfway with water (see picture 4). 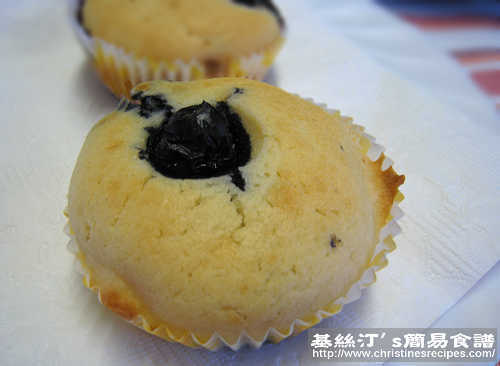 This trick will ensure to have incredible and moist muffins. Bake muffins for 18 to 24 minutes. Test the muffins with a needle. If it comes out clean, the muffins are cooked. Transfer the muffins to a wire rack to cool. It’s a great enjoyment to take muffins when they are warm. Hi, thanks for sharing. I am new in baking. May I know what cup you are using? is it using 1 cup-250ml or 1 cup=140ml?? I tried 250ml, the result is not good. What went wrong with your muffins actually? I want to make more pieces of muffins, so I use 3 cups flour.. then the mixture is too hard..But after that I used 1 Cup =120ml, the result is ok.
Oops, missed it by mistake. Thanks for asking. Updated the recipe. The baking powder is added with the flour.